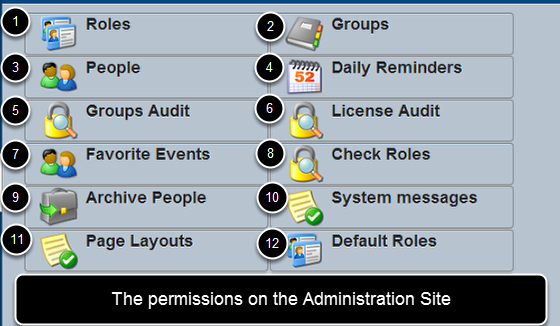 1: Roles is where you set up what System Permissions and Data Permission each type of User can access. A user MUST assigned a Role to be able to login to the system. 2: Groups is where you set up athletes that are included in a Group, and Coaches (Professionals) who can access the users in that group. A User MUST be either in a group as an athlete, or be set as a Coach of a Group to be able to login to the system. 3: People is where you can access a complete list of all users that are added to your system. This is also where you add a new user or import in new users or update any of the user's account details. 5: Groups Audit allows you to generate a .csv file of all of the athletes and coaches of groups. 7: Favourite Events allows you to set up Events as a "Favourite" on multiple users' systems at once. 8: Check Roles provides a list of any errors with the way you have set up a Role on the system (e.g. if you gave a user has access to a form, but you forgot to give them access to a database in that form and error message will appear). 9: Archive People is where you can removed users from multiple groups at once and add them to an archive group. 10: System Messages is where you set up the messages to appear on the front Page of a user's system. 11: Page Layouts is where you set up the custom layouts to suit the special layout needs of a particular group or role. 12: Default Roles enable you to set up roles for users who use the "Registration" page to register new users. Not all sites have this capability. See the Article on "Admin Locks" to find out more about how to lock Coach Administrators from being able to lock users accounts on the system. Please see the Chapter on Categories to find out more about this Module; it is a critical for maintaining your documents and resources, through to your Event Form attachments.